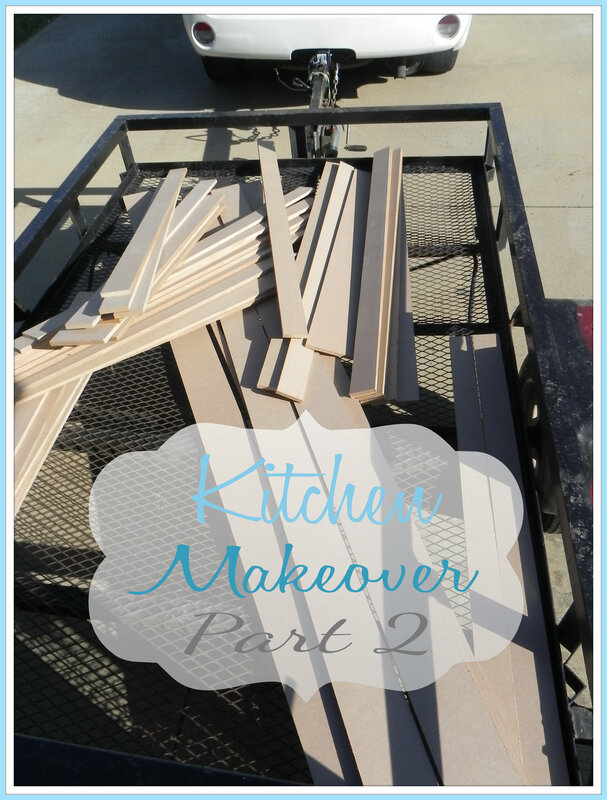 Yay for Part 2 of a 3 Part series on the Kitchen Walls Makeover!! This is the fun stuff…well I think anyway! So here we go! 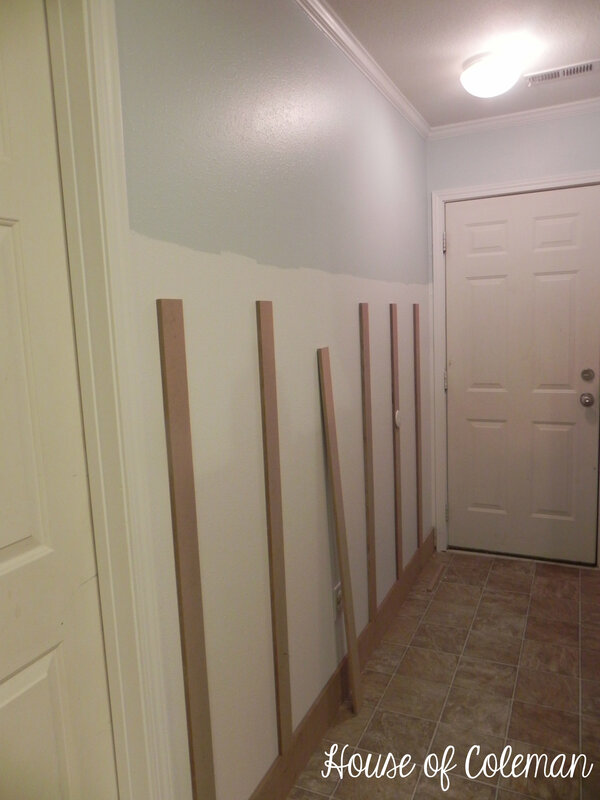 After painting the kitchen walls Valspar Satin Rising Tide (4008-3A) for the top and Valspar Satin White for the bottom part it was time to go shopping for the wood for our board and batten look I was going for. I started out by going to Lowes and finding a sheet of MDF that was 96 x 48 x .5 and I believe it was around $24 and some change for one sheet. I took the measurement home and figured out how many sheets of this we would need and what I would need cut out of each sheet. (I would suggest doing this) We ended up needing 2. 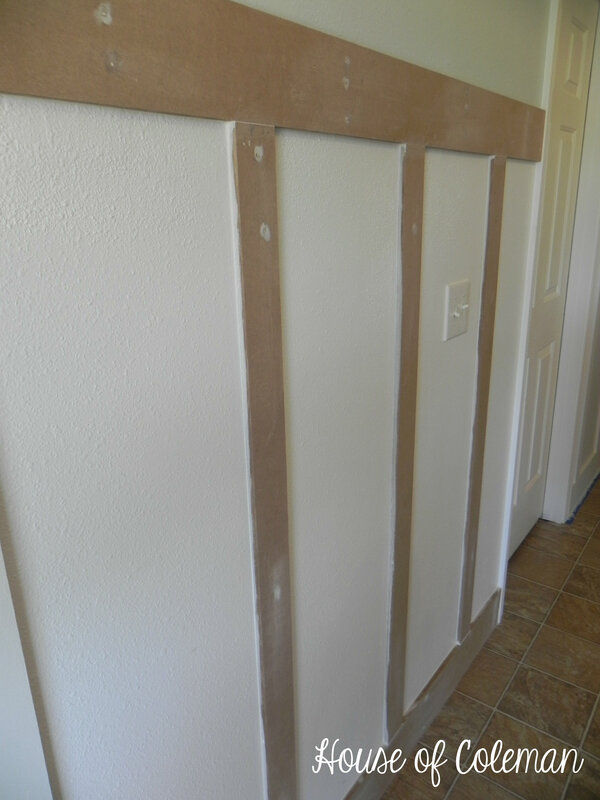 Our slats are 14″ apart from each other, we took a piece of scrap and cut it to 14 with our hand saw and that is what I used to space our slats to make sure each of them were even. We ended up shopping for our wood on Mother’s Day and thankfully there was no line to wait to have someone cut these for us! (Yes Lowes will cut your boards for you!) And the Lowes employee that was working the saw that day was very kind and patient with me while I had him cut the 2 large sheets of MDF into hundreds (just kidding) of pieces! 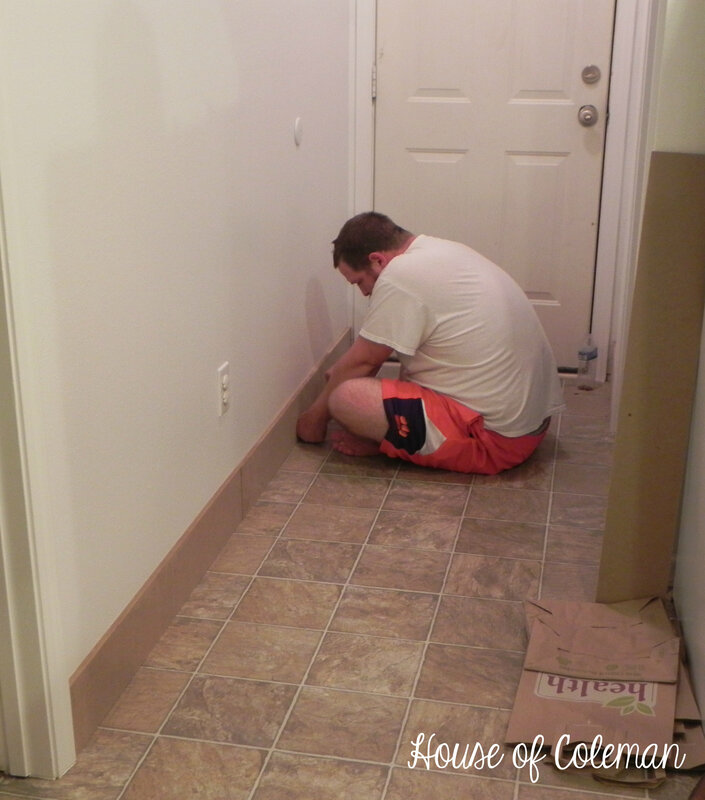 By the time he was finished cutting for us his shift was over and he was rushing for the door….lol! This part was the easiest!! 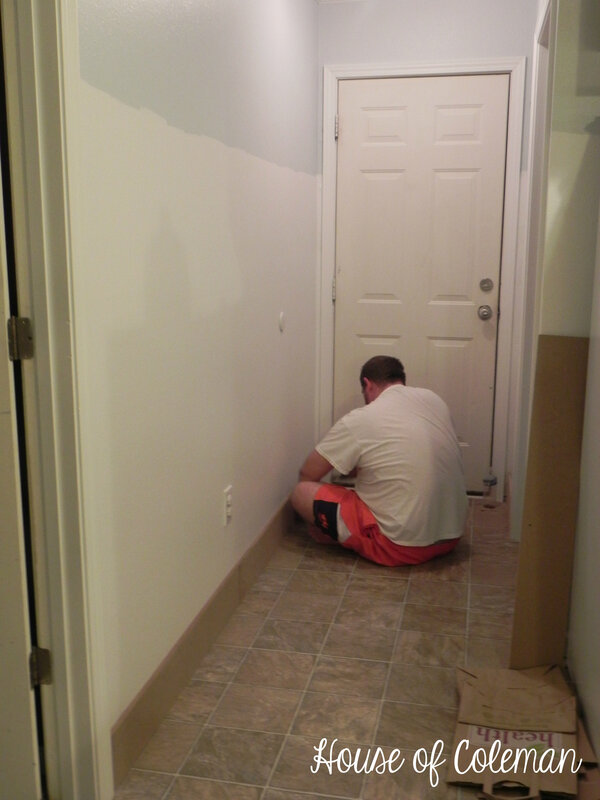 After all the baseboards were up it was time for the slats! 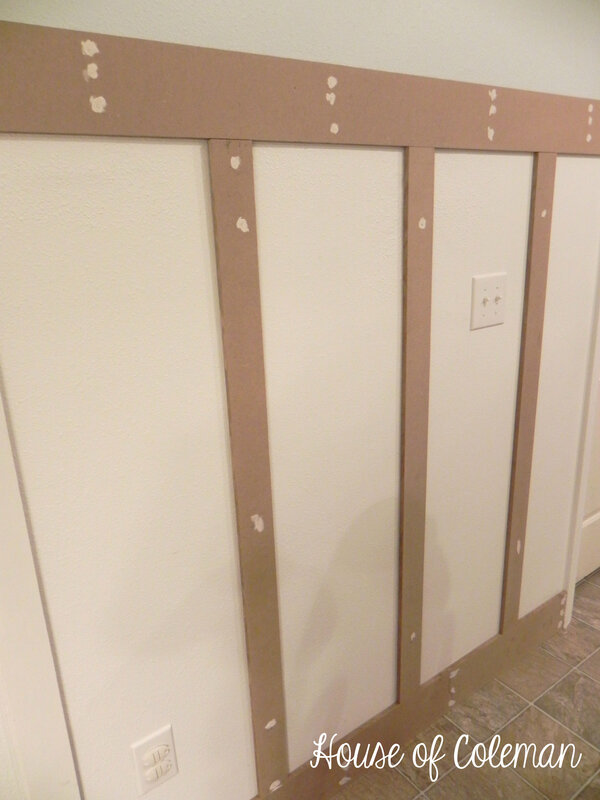 I had read in a tutorial that it would have been easier to prime the boards first before putting them up….well I started doing just that. As you can see above….but in my opinion this is not the case. I found it much more time consuming and stopped. 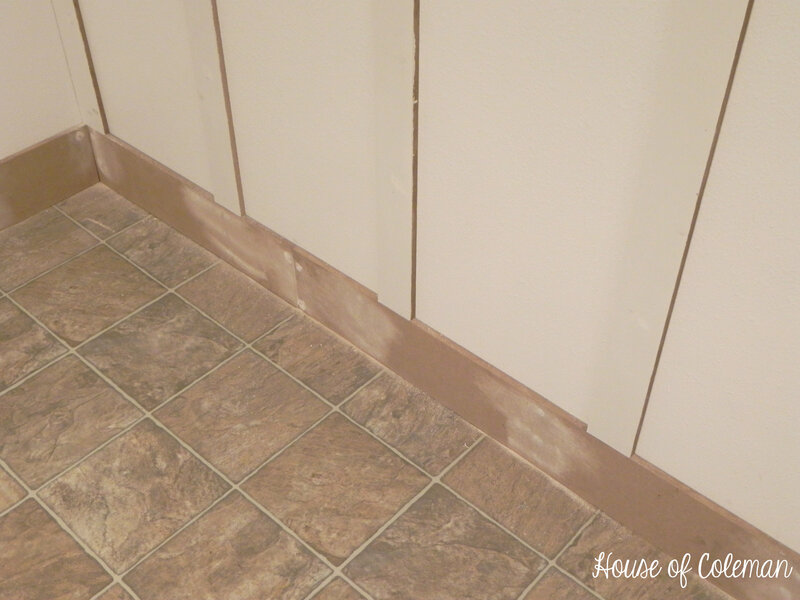 After having completed this project looking back I don’t think it would have made any difference in time, I still would have had to prime over the spackling and caulk. We didn’t have the hand saw at the time so we just went about nailing up the boards and slats around the one we needed to cut. After nailing everything in place (if you don’t use a nail gun) you need to sink all of your nails. 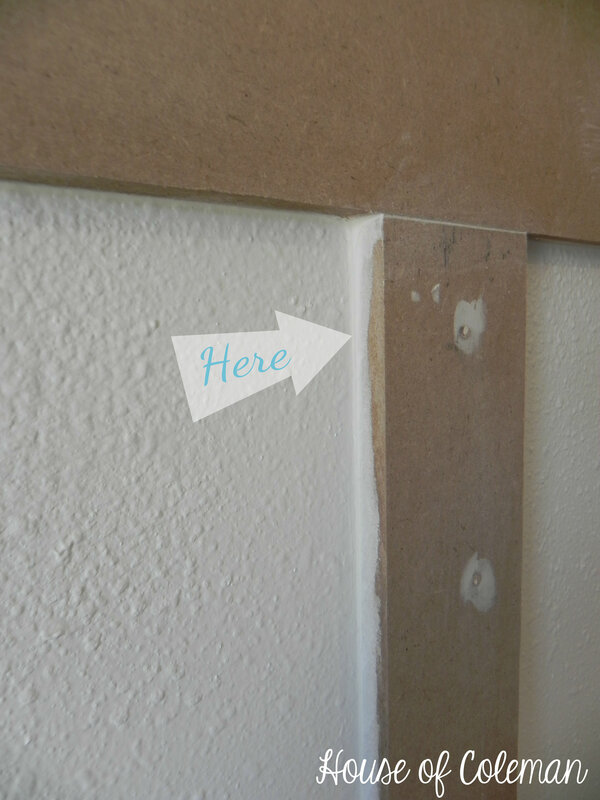 Once you have finished doing that, it’s time to spackle all of those nail holes! 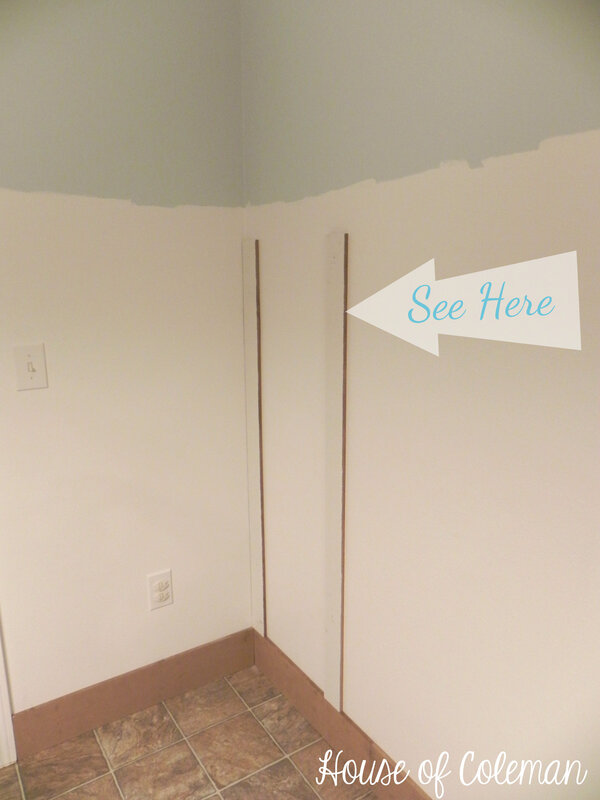 And while your spackling that you should go ahead and spackle where the slats meet the baseboard and the top board (look further down in the pictures to see a close up of the spackling where the slats meet the boards). For the nail holes I just used my finger to put the spackling on. 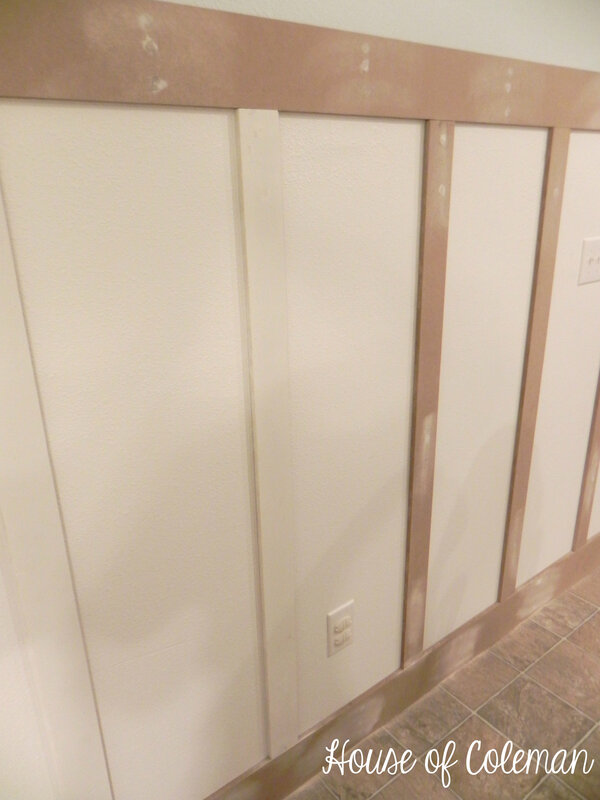 For where the slats meet the boards I used a spackling trowel. 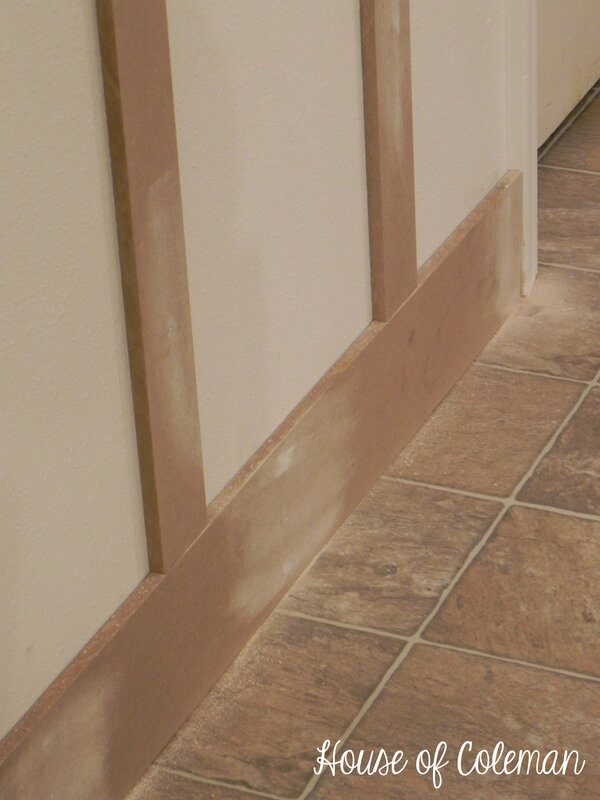 Once you have finished all the spackling it’s time to take your sanding block and sand all of those places until it is smooth. 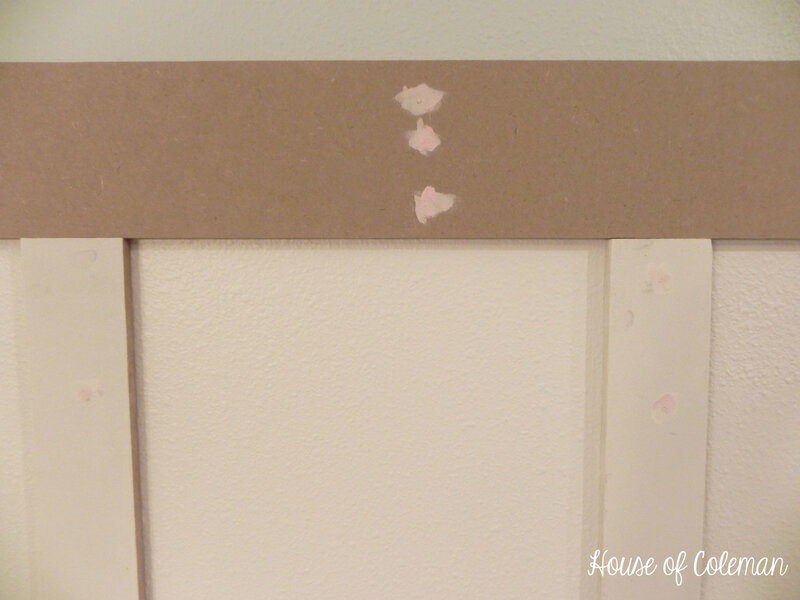 The spackling that we purchased is pink when applied and turns white when it has completely dried! Very very helpful! This will create a lovely mess! And before you move on to painting it all has to be cleaned up! I just took a wet washcloth and wiped everything down. Rinsed it a few times and wiped down again. 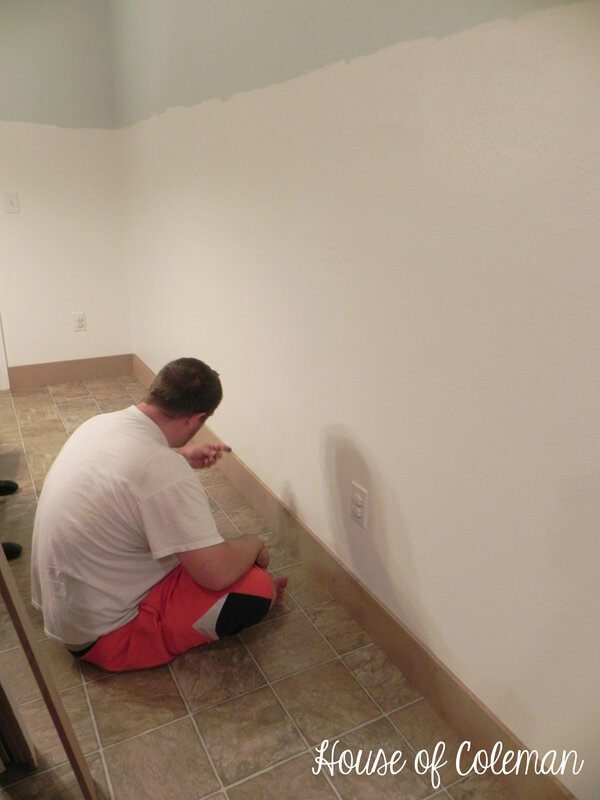 Now it’s time for caulking. I am now a pro at caulking (I’ve even been hunting down things around the house that I’ve noticed need some fresh caulking lol)! I just used my finger to smooth out the caulking, and LOTS of wet paper towels!! You should just practice on one area first until you get the hang of it. Thankfully caulking will wipe right off with a wet paper towel as long as it hasn’t dried so it’s very forgiving if you mess up! 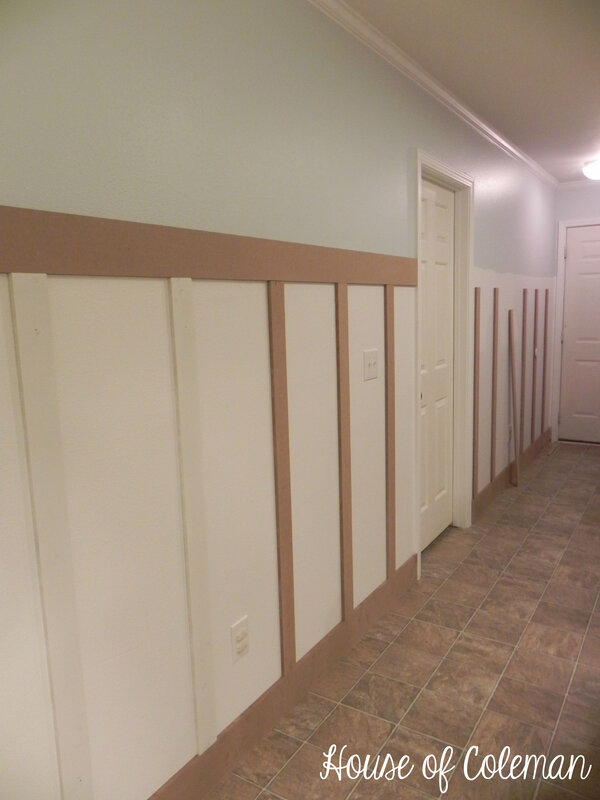 I caulked all the areas that touched the wall and I caulked all the boards that met in a corner. 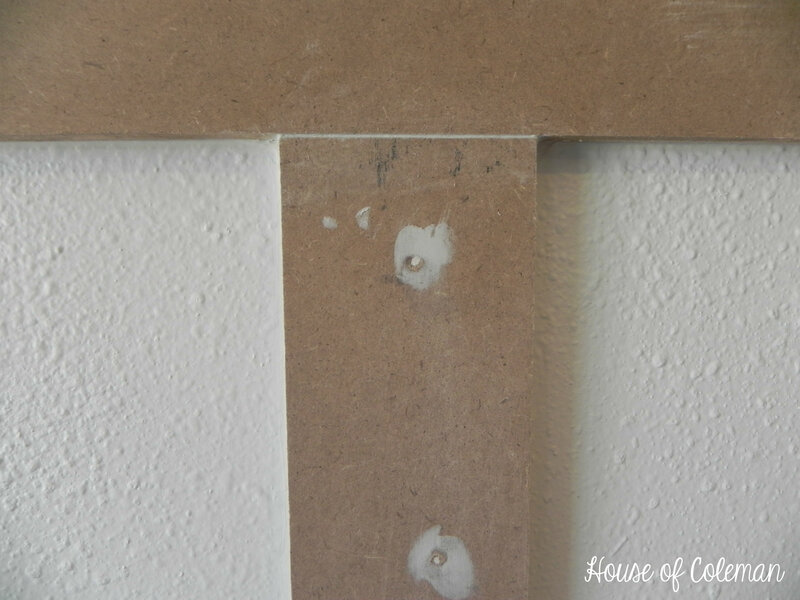 Close up of the nail holes after spackling. I would suggest that you sand down to where the only white you see is the nail hole itself. I didn’t do this in a some spots and after painting I can see a slight rise where I didn’t sand enough. I was soooo happy when I finished this part! It means painting!!! It was all coming together so well!! I couldn’t wait to get primer on these boards and finally see what it would all look like white! Keep checking back in the next few days for the 3rd and final part in our 3 part series of Kitchen Walls Makeover to see how this project turned out! !